Bitcoin extended a two-day slump as the cancellation of a technology upgrade prompted some users to switch out of the cryptocurrency, spooking speculators in an asset that’s surged more than 500 percent this year. While the cryptocurrency earlier plunged as much as 15 percent from Friday, it pared its drop to just 1.5 percent at 11:06 a.m. in London, as evidence emerged that bearish investors started to cover their short positions. Bitcoin cash, a rival that split from the original bitcoin in August, has jumped about 22 percent since Friday, according to data compiled by Coinmarketcap.com. Bitcoin cash is gaining popularity because of its larger block size, a characteristic that makes transactions cheaper and faster than the original. When a faction of the cryptocurrency community canceled plans to increase bitcoin’s block size on Wednesday — a move that would have created another offshoot — some supporters of bigger blocks rallied around bitcoin cash. The resulting volatility has been extreme even by bitcoin’s wild standards and comes amid growing interest in cryptocurrencies among regulators, banks and fund managers. While skeptics have called its rapid advance a bubble, the asset has become too big for many on Wall Street to ignore. Even after shrinking as much as $38 billion since Wednesday, bitcoin boasts a market value of about $105 billion. 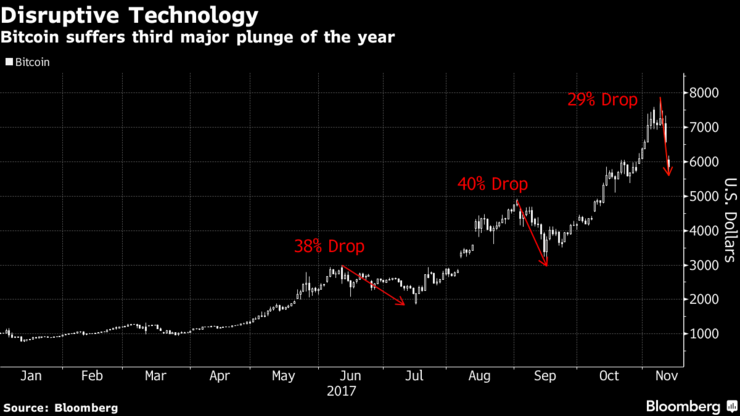 Bitcoin’s slump dragged down shares of cryptocurrency-related companies, including Hong Kong-based PC Partner Group Ltd., maker of graphics cards that can be used in the mining of digital coins. But there were few signs of wider ripple effects. Asian stocks were mixed as investors awaited continuing talks on tax legislation in the U.S. this week. While bitcoin cash surged over the weekend, it hasn’t been a straight line up. The cryptocurrency was trading at $1,161 at 11:06 a.m. in London, down from a high of about $2,478 on Sunday, Coinmarketcap.com prices show. Bitcoin has been similarly volatile; it initially rose after news that it would avoid another split, but the gains were short-lived. It’s now trading at $6,242 after touching a record $7,882 on Wednesday. 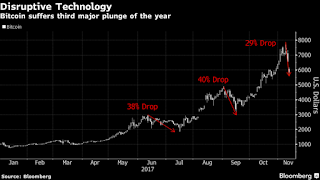 “We have seen similar steep falls in Bitcoin throughout the year — specifically in June and September — but every time a considerable decline occurs, new investors jump in to experience the new asset class,” Hussein Sayed, chief market strategist at FXTM, wrote in a note Monday.